Directions: The Coromandel Peninsula and the Mercury Bay area Drive from Auckland: 2-2.5 hours.Follow the motorway (1) South Take highway 2 - following signs to the Coromandel Peninsula. These may sound like vague directions, but if you have driven around NZ before, you'll recognize that directions actually CAN be that simple. Turn East on HWY 25 to the Peninsula After crossing the bridge, turn right, then exit left onto 25A towards Whitianga.Lonely Bay specifically: to Lonely Bay itself if heading there directly). There are flights available to Whitianga (in tiny little planes), but you will need to prepare for quite the hike if planning to go on foot from the Whitianga airport.Driving from Auckland, you would Follow signs for SH 25 towards Whitianga (Fi-ti-anga) (14 windy km) - until you see the Turnoff to Hotwater Beach and Hahei for 2km then Turn left onto Purangi Road towards Cooks Beach Road. 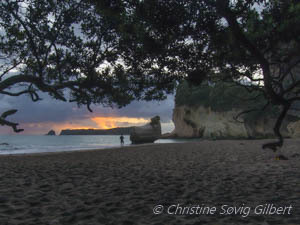 Follow for 10km(Continue straight for Cathedral Cove. )Pass the entrance to Cooks Beach, and keep a lookout on your right for the Historical Marker to Shakespeare Cliff. A gravel road will lead you up to the cliff.Do not go all the way to the top but take the turnoff to Lonely Bay on your right. The Coromandel coast is well known for Cathedral Cove, and you can see why in the shot below. But the Cove is increasingly overrun with photographers at the best times of day/year, even early early dawn. And there are plenty of other options for an adventurous photographer. As this shot of Lonely Bay – just a few miles down the road – demonstrates, adventure tourism is plentiful in the area. And the walk to the Cove itself has interesting turnoffs that are surprisingly free of people just a few steps from the main trail. Rock pools and bays are to be found among the beaches. 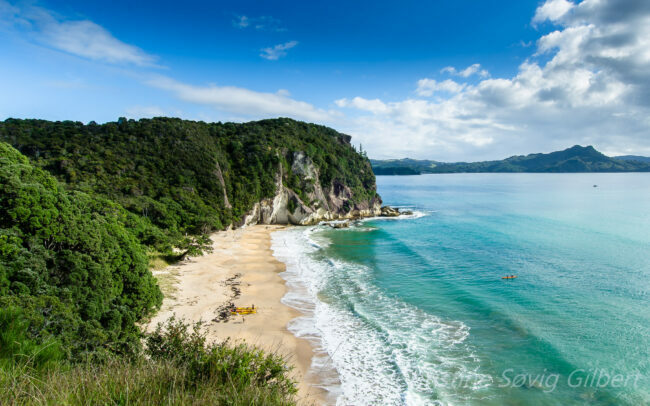 The Coromandel is not well known as a resort destination for tourists. There are plenty of camping and campervan spots, but not a great deal of hotels. There are quite a few Bed and breakfasts and holiday home rentals though. Christmas through the end of January is busy season. Not only is it the start of summer, but the New Zealanders head to their beach homes for their long school and Christmas holidays. For flowering Pohutukawas, plan on going the month before Christmas. There aren’t many left after. February and March are traditionally the warmest summer months – highs around 27-28, with cooler nights. But it can rain quite a bit. Just look at the foliage. They are not as busy as January, though, since schools go back early February. The winter, if you aren’t planning a beach holiday, August-September, can be very peaceful and quiet. And the sun still sometimes shows itself so the shots should be beautiful. The area is semi-tropical, but not warm in winter – I have never known it to more than briefly frost on the Coromandel. But it can be wet and showery. Cell phone and cellular data has great coverage but any larger than a few hundred mega bytes of data is still expensive here. There is no reliable high speed grounded internet (slow DSL and dialup do not count) East on the peninsula, although Thames, on the west side has fiber optic cable. And cell phone stick plans are the norm. Many of the local shops only take Eftpos banking cards. US credit cards do not count – there are cash machines in Whitianga and Taiyuan – not always full of cash. Come prepared. Hiking boots, a good gear backpack and light tripod are essential. Be wary of fine sand everywhere. Come prepared to have your gear ready to be wrapped up the second you put it down. Sand can and will scratch lenses. There is abundant bird life, so bring your telephoto if you like them. I would pick a couple of good primes, and a wide angle zoom, but I like wide vistas. Polarizer can be handy for the water from above. Paths can be slippery and muddy when wet on the sandstone. I don’t walk around with my camera around my neck very much. Lonely Bay faces North East, in the summer the sun will come up behind you from the South end cliff. There are often weddings on the beach on Saturdays. And occasionally, very rarely, a lonely nudist or two. If you want empty, come a weekday. The waves look best at lowish but not quite low tide. There is no defined path. Be careful of the cliff face on either side. You may find it useful to follow the path down to the Bay itself to get a look at the cliff you’ll be climbing on the East end of the Bay before braving it. I bring a helper – mainly because I’m hopeless at losing caps and batteries in the bush. There are no snakes to worry about but possums and birds. Tuis will steal shiny things. On solitary beaches, it can be important to create a focal point. The long empty surf and sand look great for a view, but can make a photo a little bland. Kayakers, tree debris, boats, and even rocks can help you give it some texture and scale. Since this spot faces North/North East, early morning is ideal. The terrain can be muddy and treacherous. The tripod is essential. And a steady foot. These are limestone cliffs. 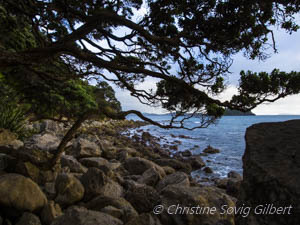 The Pohutukawas seen in my shot will actually flower with a lovely red bloom in late November – mid -December (the NZ Christmas tree) and can provide a stunning contrast to the beach.